We have talked about security on Yathit Blog before. This time, we want to talk about extension developers’ design choices, discuss trade-offs between security and ease of use and implementation costs. Chrome Extensions are very powerful tools and this kind of power comes with responsibility that falls on both the developers and the users. The user of Chrome extensions have the final say which extensions to be used, considering its usefulness and permissions. However, Chrome extensions are very different and they can interfere with Web sites if given permission. Like most Android apps, Chrome extensions tends to request more permission than that they actually need. Do not misunderstand – lots of us, both developers and users love working with these extensions. They allow customization of Chrome experience and improve overall Web browsing. 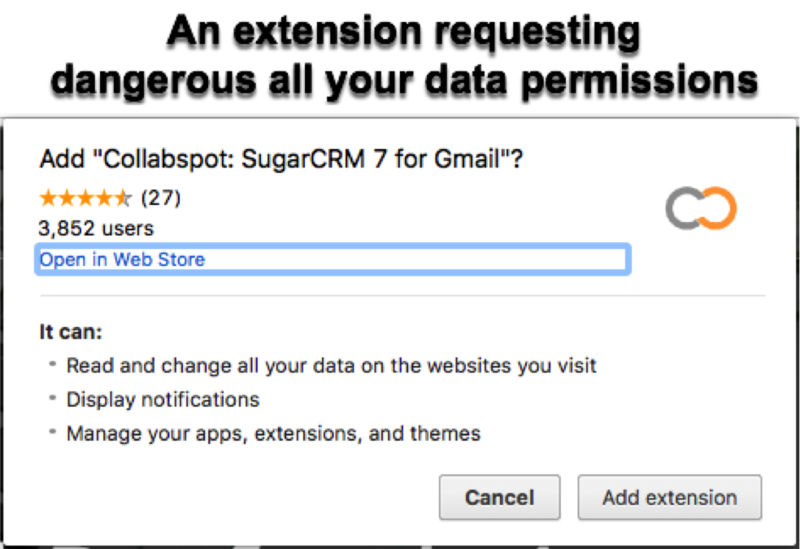 Problems arise when users forget about these extensions and leave unnecessary permissions on. These permissions range from accessing the browsing data and physical location to “All Web Site Data” permissions. This “All Web Site Data” permission is the most dangerous off all! The “All Web Site Data” permission usually comes up during installation and you have only one chance to decide whether to select it or not. See the image below showing the request “All Your Data on the Web Sites you Visit”. If you select this option, the extension may be able to read, analyze and make changes on your behalf. In the same time, a perfectly legitimate extension may fall victim to an attack by unscrupulous hackers and become a malicious threat. As a result, a simple hack can gain “super powers” and take control of Web sites you visit. Potentially, the now malicious extension can do anything on your behalf such as getting a password to a web site you use, including your financial institutions’ sites, health information and more. The extension may be able to go as far as getting your security token or cookie and transmit it to the attacker, who may be able to exploit this vulnerability to authenticate as yourself without a two-factor authentication. In many cases, these infected extensions have less nefarious goals and could be directed to violate your privacy by gathering information about your browsing habits, clickstreaming data in order to sell it to a third party, inject Ads or simply click them on your behalf. These are the reasons why we, Yathit developers’ team, are working very hard to avoid requesting “All Web site Data Permission”. A Chrome extension like ours does not need to access all your web site data. We do not need information concerning your banking, restaurant reservations or online shopping. 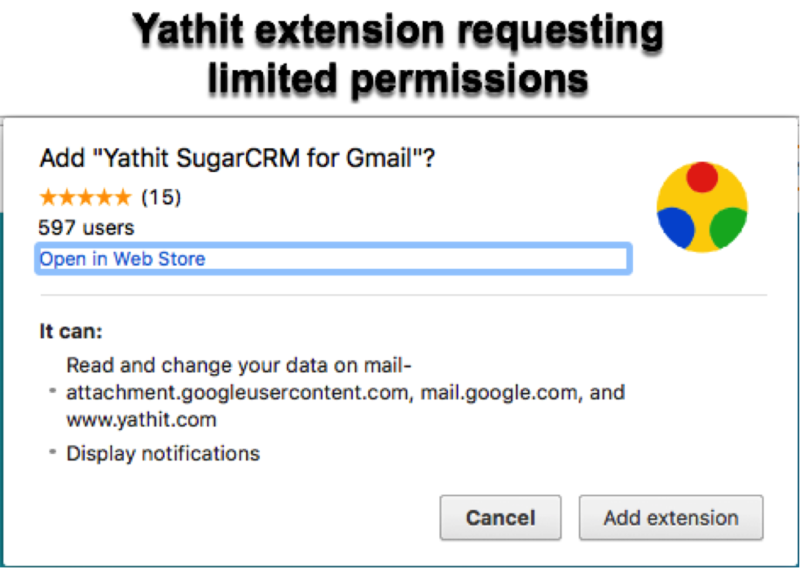 We only request permissions, which are required for proper functioning of Yathit extension, such as Gmail page and attachments. This is all the permissions we ask for during installation. We also ask for a permission to access your SugarCRM portal, but we ask for it only when a Sugar user accesses the portal. Despite looking simple, this function requires an elaborate background communication between Yathit and Chrome to curry user intent while requesting host permission request. Even after the user is granted such permission, it does not become permanent, unlike the permissions granted during installation. It takes an exceptional understanding of Chrome extensions, high-level implementation skills and security expertise to keep the permission active and prevent the extension from repeatedly asking for the permission. This is one of the reasons why many developers do not want to bother with individual permissions and try to get away with a blanket “all web site data” permission request. We also need to remember that optional permissions are fairy new functions and some browsers such as Firefox and Edge still do not support them. We would like to note that creators of extensions are responsible and ethical professionals. However, some extensions may have security issues, which could potentially be exploited by hackers. They can take over an extension and direct it against the users. During a recent Defcon Conference, a team of security researchers demonstrated this type of security breach in a speech titled “Game of Chromes: Owning the Web with Zombie Chrome Extensions”. The presentation talks about a series of events, which unfolded on April 16, 2016 when Wix servers were attacked by an army of bots, creating new accounts and publishing a number of shady sites. The attack was executed by a malicious Chrome extension installed on tens of thousands of devices, simultaneously sending HTTP requests. This extension bot used Wix websites platform and Facebook messaging service to distribute itself. The same perpetrators attacked again two months later. This time they used infectious notifications popping up on Facebook, which led to a malicious JSE file. Upon clicking, the file installed a Chrome extension on the victim’s browser and the extension spread again through Facebook messaging. We, the Yathit team, take cyber security extremely seriously. Security cannot by just talk and awareness – a concrete action is necessary to minimize threats and protect our users as well as the product. The developer’s responsibility is to assure security. As users, we must choose wisely.